Trigger warning: Descriptions and images of child abuse follow. Actually, Mr. President, the facts and circumstances are not as you portray. You pardoned abusers of both federal public lands and federal public officials who also abused a child member of their family. From personal experience dating back to the early 1980s, I have found the Hammonds to be scofflaws, long before their conviction on arson charges. In fact, the chronically obnoxious and threatening behavior of the Hammonds toward me and other conservationists working to conserve the Oregon desert for this and future generations was a contributing factor in my decision to carry a licensed concealed handgun in Oregon. (Of course, it was only a contributing factor in that I was getting countless death threats at the time for work to end the logging of old-growth forests in the Pacific Northwest). More important, there is a long official record of the Hammonds being scofflaws. Figure 1. 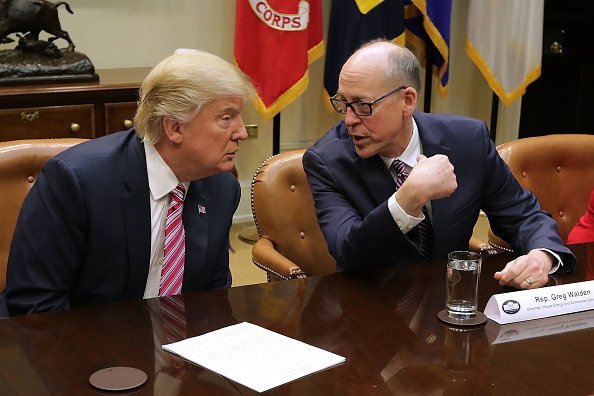 Representative Greg Walden (R-2nd-OR) led the effort to secure a presidential pardon for the Hammonds.Source: Chip Somodevilla/GettyImages. Hammond Ranches, Inc., consists of ~12,000 acres as well as permission to graze 26,420 acres of Bureau of Land Management holdings in what is now the congressionally designated Steens Mountain Cooperative Management and Protection Area. The ranch is located in Harney County, Oregon, Oregon’s second largest county at 10, 226 square miles (population ~7,700 people and ~107,800 livestock), approximately the size of the state of Maryland. The crime that resulted in the conviction and sentencing of the pair that our president has pardoned wasn’t the first time the Hammonds were in trouble with the feds. As reported in High Country News and the Washington Post, the Hammonds were permitted by the Fish and Wildlife Service (FWS) to trail their livestock across Malheur National Wildlife Refuge, but they allowed livestock to linger, trashing streams and stomping on young willows planted by refuge staff to redress past grazing abuses. Refuge managers were quite patient with the truculent Hammonds but received death threats from them in 1986, 1988, 1991, and 1994. In 1994, the Hammonds’ grazing permit on the refuge was canceled for repeatedly violating the conditions of the permit, which allowed them to move their cows across the refuge only at specific times. The FWS planned to build a fence along the refuge boundary to keep Hammond livestock out of an irrigation canal. On August 3, 1994, the day the fence was to be built, Dwight Hammond parked his Caterpillar scraper on the boundary line and disabled it. As a consequence, on that day nine federal agents, five armed, arrested Dwight and Steven Hammond and charged them with two counts each of felony “disturbing and interfering with” federal officials or federal contractors. They spent two nights in jail before being released without bail by a federal magistrate. On August 10, five hundred incensed ranchers and their supporters rallied in Burns, seeking to free the Hammonds. The next day, then Representative Bob Smith (R-2nd-OR) asked Interior Secretary Bruce Babbitt to have his subordinates back off. It apparently worked as, on August 15, the US Attorney’s Office reduced the charges from felonies with a maximum sentence of three years in prison and up to a $250,000 fine to misdemeanors with a jail term of up to one year and a $100,000 fine on each count. In 1999, the Bureau of Land Management (BLM) sent a letter to the Hammonds charging that Steven had set a fire on Hammond Ranch land that had spread to BLM holdings. The BLM manager warned them not to do it again. That same year, Steven confronted hunters on federal public land and discharged his weapon several times, claiming he was shooting at rabbits. The jury convicted both of the Hammonds of using fire to destroy federal property for a 2001 arson known as the Hardie-Hammond Fire, located in the Steens Mountain Cooperative Management and Protection Area. Witnesses at trial, including a relative of the Hammonds, testified the arson occurred shortly after Steven Hammond and his hunting party illegally slaughtered several deer on BLM property. Jurors were told that Steven Hammond handed out “Strike Anywhere” matches with instructions that they be lit and dropped on the ground because they were going to “light up the whole country on fire.” One witness testified that he barely escaped the eight to ten foot high flames caused by the arson. The fire consumed 139 acres of public land and destroyed all evidence of the game violations. After committing the arson, Steven Hammond called the BLM office in Burns, Oregon and claimed the fire was started on Hammond property to burn off invasive species and had inadvertently burned onto public lands. Dwight and Steven Hammond told one of their relatives to keep his mouth shut and that nobody needed to know about the fire. The jury also convicted Steven Hammond of using fire to destroy federal property regarding a 2006 arson known as the Krumbo Butte Fire located in the Malheur National Wildlife Refuge and Steens Mountain Cooperative Management and Protection Area. An August lightning storm started numerous fires and a burn ban was in effect while BLM firefighters fought those fires. Despite the ban, without permission or notification to BLM, Steven Hammond started several “back fires” in an attempt save the ranch’s winter feed. The fires burned onto public land and were seen by BLM firefighters camped nearby. The firefighters took steps to ensure their safety and reported the arsons. The Hammonds were convicted by a jury of twelve people good and true, under the Antiterrorism and Effective Death Penalty Act of 1996, enacted by Congress after the bombing of a federal building in Oklahoma City. The convictions carried minimum sentences of five years in prison. Disregarding the statutory minimum sentence requirements, US District Court Judge Michael Hogan sentenced Steve to twelve months and one day imprisonment and Dwight to only three months of imprisonment. Hogan said he thought Congress hadn’t meant the statute to apply to fires in “the wilderness.” The judge also cited Eighth Amendment concerns about cruel and unusual punishment. In a rare event, the US Attorney’s Office for Oregon appealed the lenient sentences to the US Ninth Circuit Court of Appeals. A three-judge appeals court panel found that Hogan “illegally sentenced” the Hammonds and that such a sentence was not “cruel and unusual.” The appeals court noted that “[g]iven the seriousness of arson, a five-year sentence is not grossly disproportionate to the offense.” Upon remand to the US District Court of Oregon, another federal judge, Anne Aiken, imposed the mandatory sentence as required by law. Federal mandatory minimum sentences, whereby Congress not only defines the crime but also prescribes the punishment, leave no room for a sentencing judge to exercise discretion in the pursuit of justice. No matter that there might be mitigating circumstances that if taken into consideration by the judge who heard the case would result in better justice. Seventy-seven percent of Americans think that mandatory minimum sentences should be abolished, as do I. Judges should be allowed to judge, not merely administer. However, as long as mandatory minimum sentences exist, they need to be applied equally to white male criminals wearing cowboy hats and to black male criminals wearing hoodies. In my view, by definition grazing federal public land—be it on Bureau of Land Management holdings in the Steens Mountain Cooperative Management and Protection Area or on Fish and Wildlife Service holdings within the Malheur National Wildlife Refuge—is land abuse. The Hammonds have long done both. Alas, such run-of-the-cow abuse rarely results in pushback by these federal land management agencies. In cases where it does, it is only for extremely egregious behavior, usually against federal officials more than against federal land. The Hammond bunch have a long record of antisocial behavior toward government officials who have administered public lands near their ranch and/or upon which they graze their livestock. The Malheur occupation of forty-one days resulted in twenty-five convictions(not enough). It should be noted that while the Hammonds were showing the government the back of one hand, the other hand was receiving handouts. From 1995 through 2016, Hammond Ranches received $911,336 in conservation, disaster, and commodity subsidies from Uncle Sam, along with another $551,674 in livestock subsidies, not including the additional subsidies they received from the ridiculously low BLM grazing fee. For the record, I was heavily involved in the enactment of the Steens Act, an act of Congress in 2000 that established the 496,135-acre Steens Mountain Cooperative Management and Protection Area, the 174,774-acre Steens Mountain Wilderness (99,859 acres of which is livestock-free), ~29 miles of national Wild and Scenic Rivers protections for Steens Mountain streams, and a 652,023-acre mineral withdrawal area east of Steens Mountain, including the Alvord Desert. I have long opposed domestic livestock grazing, including on the Malheur National Wildlife Refuge. The Steens Act was the result of a deal negotiated between conservationists and cattle interests. While most land and cattle barons on and near Steens Mountain participated, the Hammonds by choice did not. The deal was a large net gain for the conservation and restoration of nature, but the land and cattle barons made out like bandits. They profited at the public expense, but the public profited more because of the conservation benefits of the legislation. That one witness who testified that he was ordered to help set the 2001 fire and that “he barely escaped” the flames caused by said arson (and only by sitting in a creek) is Dusty Hammond, the nephew of Steven and the grandson of Dwight. By itself, this being ordered to help set a fire is suggestive of child abuse under Oregon law. However, it gets worse—far worse (trigger warning #2). The following quotations are from an investigation report filed with the Harney County Sheriff’s Office. The narrative, dated 23 March 2004, was written by a deputy sheriff who, with an Oregon social worker, interviewed Dusty, who was sixteen at the time. Dusty told me that about four to five (4-5) weeks ago he had scratched some initials into his shoulder/chest area with a paper clip. Dusty told me that he had scratched one letter on one side of his chest and another letter on the other side of his chest. Dusty stated he had scratched a “J” on one side and an “S” on the other side. Dusty told me that about on about February 29, 2004 that his grandparents, Dwight and Susan Hammond, found out about Dusty scratching the initials into his chest. Dusty stated that his grandparents did not know how to handle the situation with Dusty, so they called Dusty’s uncle, Steven Hammond. Dusty told me that Steve is the one that disciplines him on any matters that his grandparents do not know how to handle. Dusty told me that on February 29, 2004 between 7:00PM and about 8:00PM Steve talked to Dusty about the initials that Dusty had scratched into his chest. Dusty stated that Steve was very upset with him. Dusty told me that his grandparents were present during this time. Dusty stated that Steve told him that he was not going to let Dusty deface the family by carving on himself. Dusty stated that Steve then took him and began to sand the initials off of his chest. Dusty told me that Steve sanded on each side of his chest for at least five (5) minutes. Dusty told me that Steve used a very coarse sand paper to sand off the initials. Dusty told me that the process was very painful, but that he did not cry because he knew that Steve would continue the process for a longer period of time. Dusty stated that his grandmother was present during the entire sanding process, but that his grandfather got up about half way through and left the room. Dusty told me that Steve told him that if the sanding did not remove the initials, that he would filet the initials off of Dusty’s chest. Dusty told me that after Steve was finished with the sanding process, that the areas were bleeding. Dusty told me that his grandmother, Susan Hammond told Dusty to go clean the area up and not to have a pitty [sic] party. • forcing Dusty to eat two cans of Skoal smokeless tobacco and then again walk those ten miles back to the ranch for being cited as a minor in possession of tobacco. According to the same investigation report, on March 16, 2004, the deputy questioned Dwight, Steve, and Susie (grandmother) Hammond at the Hammond Ranch. The suspects refused to allow the interview to be tape recorded and, after being advised of their Miranda rights, agreed to talk. The deputy redirected them to the incidents at hand. Dwight said he had administered only one can of chewing tobacco and it was over several days. He said he had given Dusty “a shot of alcohol” as part of showing him how bad alcohol is. All refused to answer whether the ten-mile punishment walks had occurred. Steve Hammond began by telling me that raising kids is like raising cows or dogs. Steve then told me that Dusty was lucky that he was not at the ranch when he told on Dwight, Susie and himself or there would have been hell to pay and Dusty would have wished he wasn’t alive. I explained to the Hammonds that it was not Dusty that was pursuing this investigation, that it was the State of Oregon. Steve Hammond told me that he did not agree with the government getting involved in family matters, that none of the government agencies had ever done anything to help the situation. At this point I had to get the Hammonds back on the subject about the sanding incident. Dwight Hammond told me that Dusty had accidentally showed him the carvings of the initials on his chest. That a family meeting was called to discuss the incident. Dwight said everyone was present including Dusty. Dwight told me that Dusty was given an opportunity to come up with an alternative punishment. Dwight told me that after a while when Dusty was not able to come up with a punishment, that it was decided by the family that the initials would be sanded off. All of the Hammonds told me that it was decided mutually and agreed upon by everyone including Dusty that this was a good plan. Steve Hammond told me that they have been trying to teach Dusty to respect his body. During the interview I asked approximately ten (10) times who actually did the sanding on Dusty’s chest, but no one would ever tell me. The Hammonds continued to change the subject when asked. The Hammonds told me that after the sanding was completed Dusty made the comment that he did not think the areas were sanded deep enough and thought that he should use steel wool to sand the areas some more. The Hammonds told me that they do not know if he actually sanded the areas anymore. Susie Hammond told me that she told him to use alcohol and Neosporin on the injuries to clean them. The Hammonds told me that none of them saw the injuries after that time. Figure 2. This image was presented at the federal trial of the Hammonds on arson charges in 2016. Source: Harney County Sheriff’s Office. A presidential pardon should be reserved for those who have shown remorse. The Hammonds have shown none, neither for their abuse of public lands, nor public officials, nor a child who is a family member. A pardon should also generally be reserved for persons of generally good character who did a specific bad thing (for which they have shown remorse). America needs a better president.